Photo: Wikimedia Commons. 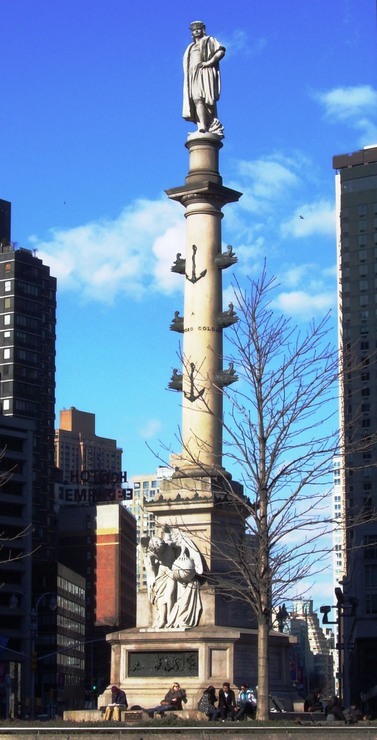 The Columbus Monument at the south west (main) entrance to Central Park at 59th Street and Central Park West (and Broadway), created by Italian sculptor Gaetano Russo and dedicated in 1892. By the 1930s it was severely stained by soot, its base was cracked by vibration, and natural veins in the sculpture itself were opened by vibration and weathering. It was cleaned and restored by the New Deal Monument Restoration Project under Karl Gruppe. And by 2011, when this photo was taken, it was badly in need of another restoration! Maine Monument, New York City Parks website.